If you want add a few CSS tweaks to your site, you can do so right from the UberMenu Control Panel. (For significant amounts of CSS, it’s better to use the custom.css stylesheet). There are 3 Custom Tweaks boxes. 1. Custom CSS Tweaks – For styles that should apply to the menu at any size, add them to the first box. 2. Custom CSS Tweaks – Mobile – For styles that should only apply below the responsive breakpoint (mobile), add them to the second box. 3. 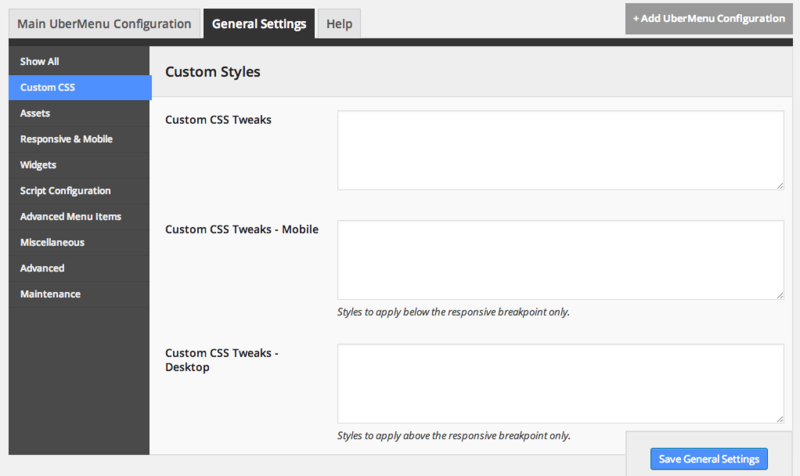 Custom CSS Tweaks – Desktop – For styles that should only apply above the responsive breakpoint (desktop sites), add them to the third box.